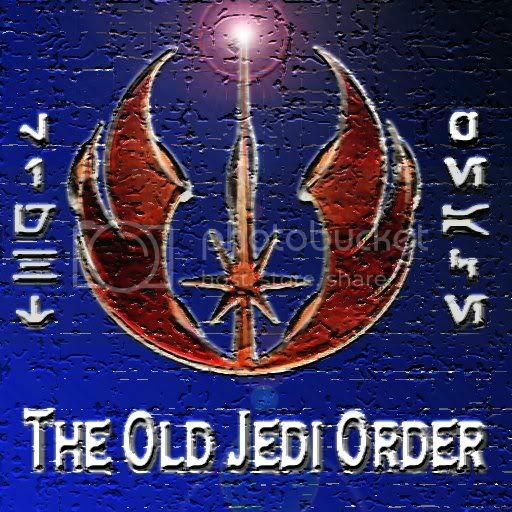 The Jedi Order, later known as the Old Jedi Order and referred to as the Holy Order of the Jedi Knights, was an ancient monastic peacekeeping organization unified by its belief and observance of the Force, specifically the light side. The Jedi were the guardians of peace and justice in the Galactic Republic, and became the most famous of the various groups that relied on the Force for their power. Led by a series of Jedi Councils, the Order grew over the millennia despite facing many trials, most often threats from the Sith, wielders of the dark side of the Force. During several Great Schisms, Dark Jedi broke away from the order. These schisms led to several wars including the Hundred Year Darkness after which the Dark Jedi fled and founded the Sith Empire. The Sith were eventually found by the Republic and their discovery led to The Great Hyperspace War, and a Sith invasion of Coruscant. The Jedi on Coruscant, led by Jedi Guardian Anavus Svag and Jedi Master Memit Nadill, successfully defended the planet and defeated the Sith. But their dark brethren wouldn't stay defeated for long and during the next several thousand years many wars would be fought. A thousand years later, after The Great Sith War, the Mandalorians saw their chance and attacked the weakened Republic. After the war, the Jedi that had led the Republic's military, Revan and Alek Squinquargesimus, disappeared. When they returned it became clear they had turned to the Dark Side, and during the war that followed many Jedi died. During the aftermath the Order was left numbering less than one-hundred Jedi, until it was rebuilt by the Jedi Exile and the Lost Jedi. Many years later the galaxy was again engulfed in a War between the Republic and the Sith. Led by Lord Hoth, the Jedi were able to regroup and push back the Sith, who eventually withdrew to the planet Ruusan. After seven long battles on Ruusan the Sith were defeated and presumed wiped out. One of them managed to survive and reorganize the Sith Order. Though Darth Bane and the Sith Lords that followed in his footsteps remained hidden, they were patient. Millennia later they revealed themselves, determined to have their revenge. After a crisis, the Republic was split in two and a war once again engulfed the galaxy. During the Clone Wars, the Republic's armies were once again led by the Jedi. During the first battle of the war, nearly two hundred Jedi died before Master Yoda and a Clone army arrived to assist them. However, nobody expected that the Supreme Chancellor was in fact a Sith Lord. The Jedi eventually learned the truth, but it was already too late. The Order was virtually annihilated by the Sith and betrayed by the Republic they had served for millennia. Only a few survived the Great Jedi Purge. However, the Jedi Luke Skywalker eventually defeated the Sith and formed the New Jedi Order during the time of the New Republic. GU History and mission statement. The Jedi have long forgotten the teachings of the light, and the true essence of the force. We embrace the light of the force and the purity of its existance, and vow to purge the darkside from the force like our previous sucessors had tried to achieve. We are servants of the force. The Old Jedi Order was revived by Azlum Grimlock, shortly after the Galactic Empire was assualted and defeated by the RLF. After Azlum, and the former Empress Talmerith Jael went into hiding to prevent the Empire from seeking her out and taking revenge for her betrayal. Azlum trained Talmerith on Corellia for a great deal of time. After time progressed the two of them returned to the galaxy as Master and Apprentice. The RLF had taken over coruscant and the creation of the New Republic went underway. Azlum realized that the republic was returning, but felt that the Jedi were non-existant, and the republic needed guardians to protect their establishment. After many nights of planning and researching Azlum decided to take his teachings to the planet Talus. The planet was beautiful and very peaceful. He met with some former criminals who wanted to change their lives. Azlum offered to help them fix what they had done, and to start over in their lives. In exchange they offered to help him build a new Jedi Temple on Talus. Azlum agreed and then the building of the temple began. After months and months of hard work the temple was finished. On the day it finished, Azlum brought the Jedi Covenant, the PGA, and the New Fel empire to his temple and declared the Old Jedi Order was revived. He would use his teachings that he himself underwent in the times of the Old Order to bring back the Old Jedi Order's ways. In honor of his former master Ulran, and the other Jedi Master's of his time. That day the first padawan was knighted in his temple. Risha Caldero was made a Jedi Knight, and the order began. Shortly after, the PGA and the Covenant met with Azlum and the chancellor wanted the Jedi to return to the republic as their protectors. Azlum and the Covenant agreed to do so. The story of the Old Jedi Order, has just begun. Firstly, this order is a Galactic Unity order. In order to join this group you must first speak to the Grand Master ICly, and all applications will be handed to your character ICly. The Rules are there to help us handle situations, and obviously there is always room for exceptions. We are not 100% strict on these rules, they exist to help us incase of problems. But please do not take advantage of them. A) You will be forced to RP exile from the order, without any arguing OOCly. They way you are exiled will be up to you. Here are the OOC rules for the Order. 1. No OOC drama, it will result in the options above. 2. All training must be done ICly and your master will record ICly with his datapad your teachings. Those teachings will be overlooked by the Grandmaster and filed in his office for proof. 3. You are not a god; please do not make it utterly simple to succeed in your training with your master. All of our characters have struggled through training. It is not easy to become a Jedi. If you are over successive and never fail, a possible void could come into place. 4. You may not play more than one character on your same character while in the order. 5. All punishment dealt towards your character will be done ICly and never OOCly. If that does happen please inform the grandmaster immediately. 6. You may not be in multiple Jedi groups and/or orders, or groups of opposing/conflicting factions. The only exception would be groups that are totally OOC. 7. Know that grey jedi ICly will be exiled from the order. This is a 100% completely lightside jedi order, just like the old republic before the Galactic Civil War. 8. NO ONE WILL COME INTO THE ORDER AS A MASTER WITHOUT HAVING BEEN TRAINED IN AN ORDER ON SL, AND ACTUALLY HAVE BEEN ACCEPTABLE. Masters from NJO, KOJ are not acceptable. Considering we have seen someone go from padawan to knight in a few days. 9. The Training in this order is very extensive, and could take a long time to actually achieve the rank of knight or master. Becoming a Knight will be decided by the Jedi Council and then approved by the Grandmaster. The time IRL would take 4-5 months rise from initiate to knight. Believe me. Once you have achieved such a goal your RP ability will be greatly increased. Take your time, and you will see yourself rewarded not from us but from yourself. You will feel great about actually undergoing such training, even though it took a long time. 10. Basic GU rules apply on our sim, follow them or get in trouble. If you are banned on one of their Sims, or on Coruscant, you will be banned here, and that will result in the options above. 11. If you are inactive for more than a month and have not told anyone OOCly your character will be pointed as MIA, and or presumed dead. You will be ejected from the group after that. 12. We do not teach how to Roleplay, therefor you must already know how to RP before you join the order. It is not our job to teach you. 13. We do not accept people claiming to be related to important characters in the SW-universe. It is frowned upon, and seen as unimaginative. If you claim this with your character, it will more than likely result in a decline of the group OOCly from one of the group owners. When you claim to be related to important characters, it comes off as saying; "I am more important than other characters in SWRP." We do not want to achieve that in RP.